AIM: Some studies have indicated that over-reliance on inhaled bronchodilator (beta 2-agonist) therapy may worsen asthma control and increase morbidity. The aim of this study was to measure urinary concentrations of salbutamol, the most commonly used bronchodilator, in a relatively large sample of asthmatic patients and examine the potential value of the concentration as an indicator of over-use of salbutamol. METHOD: The urinary concentrations of the drug were measured in 'spot' urine samples from 102 asthmatic patients (64 community patients and 38 hospital inpatients). A solid-phase extraction technique, using a phenyl-bonded phase and a reversed-phase ion-pair high-performance liquid chromatography assay with UV-detection were developed and used to measure both unchanged salbutamol concentrations and total salbutamol concentrations after enzymatic hydrolysis of the metabolite. In addition, salbutamol concentrations were corrected for urine dilution, with the measured drug expressed per gram of urinary creatinine. RESULTS: The hospital patients were generally older, had greater disease severity, were more likely to be receiving prophylactic therapy and had received more salbutamol in the past 24 h. The urinary concentrations of salbutamol varied enormously between patients. The median concentrations of unchanged and total drug were 0.38 microgram/ml (range 0-34.4 micrograms/ml) and 2.55 micrograms/ml (range 0-49.8 micrograms/ml), respectively. Even when controlling for dosage in the preceding 24 h, there was a 262-fold and 810-fold variation in the urinary concentrations for unchanged and total salbutamol, respectively, among the community patients. Modest correlations were found between salbutamol concentrations and dosage administered in the preceding 24 h (Spearman's r = 0.67 and 0.54 for unchanged and total drug, respectively; P < 0.001). The correlations improved only slightly with correction for urine dilution (Spearman's r = 0.69 and 0.57 for unchanged and total drug, respectively; P < 0.001). 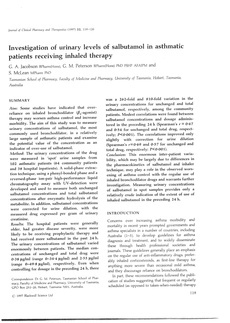 CONCLUSION: This enormous inter-patient variability, which may be largely due to differences in the pharmacokinetics of salbutamol and inhaler technique, may play a role in the observed worsening of asthma control with the regular use of inhaled bronchodilator drugs and warrants further investigation. Measuring urinary concentrations of salbutamol in spot samples provides only a relatively crude indication of the extent of use of inhaled salbutamol in the preceding 24 h.